Step into the show and be whisked off to the 19th century city at the height of the Impressionist Movement and in the wake of the Industrial Revolution. As ready-to-wear clothing becomes more widely available to women the path is paved for fashion magazines to line the purses of ladies traveling on the train or dining al-fresco. As you wind your way through the exhibition take a careful look at the garments on display and compare them to those in the paintings. Notice the similarities in the fabrics and the draping of the cloth. Then take a close look at who painted the portrait. Do you see the name of an Impressionist? Have you ever seen a portrait by Monet? A few interesting things can be learned from the show. Stepping into the second gallery, to the right of the first, on display is a beautiful white gown designed for a day on the beach. This is no ordinary gown, however, not only is it beach wear, but it is washable! Most of the fabrics used in the ornate dresses are not washable. In fact, those that are designed to wear on the street are made from dark fabrics to hide dirt. Further on we find a gallery of ladies in white. In the far corner is a work by James Tissot called Seaside. It is a portrait of a lady lounging on a couch in a white dress with bows on it, but look at the painting beside it, isn’t that the same dress on a different lady! In fact, a quick search online shows a third portrait of a woman in that dress, which I have illustrated above. Tissot, like many painters of that era and even today owned items of fashion which he would use as props in his illustrations. There are many paintings by Tissot in the exhibition, although the Art Institute does not own any of them. Tissot’s paintings stand out by their realistic qualities and careful attention to detail. 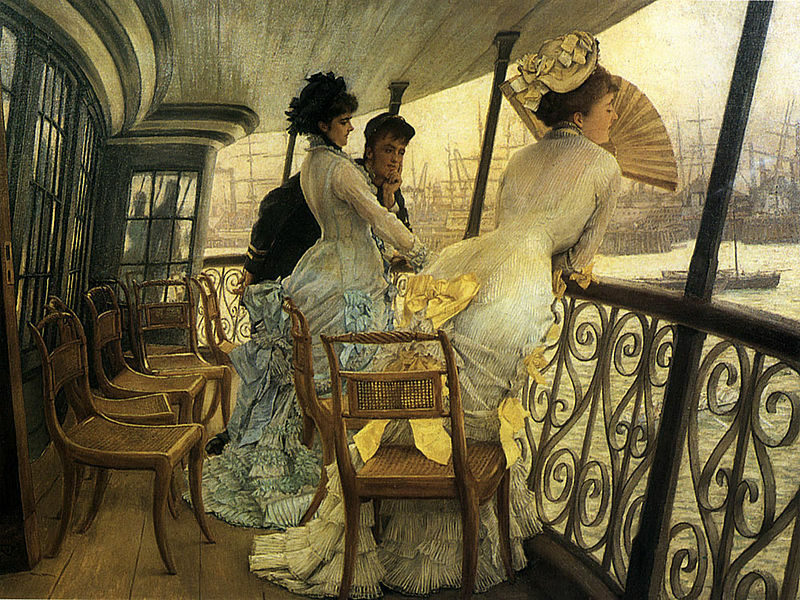 Tissot was not an Impressionist, but he was close to them and he was celebrated for his depictions of fashionable life. Tissot’s painting The Shop Girl welcomes you to the next gallery which is full of Victorian accessories from hats to shoes to perfume bottles. Take note of how tiny the hands that fit inside the pair of gloves must be, of course the average height for a woman at that time was only 5’2. 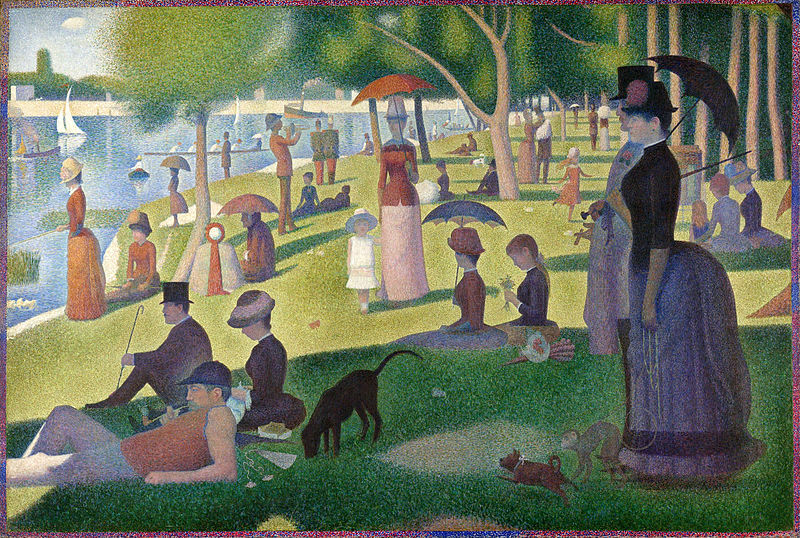 Continuing through the show you will find yourself in the park and in front of a life-sized canvas of a picnic. Lunch on the Grass, by Monet, was an ambitious project never completed. You will see that it is in two pieces. Monet had left the painting with his landlord as collateral when he owed rent. By the time he came back to retrieve the painting it had suffered water damage and he cut the canvas into pieces, keeping the good parts. Next to the painting is a small rendering of what the completed piece may have looked like. The show continues through intricate evening gowns, boudoirs of people in questionable scenarios, down the streets of Paris where the middle class and upper class start to blend and finishes with Seurat’s La Grande Jatte. You’ve probably seen this painting many times before, but have you ever taken a close look at the bustle of the woman with the monkey? As Seurat created this masterpiece fashion continued to evolve and he had to expand her original bustle line to make it larger! Impressionism, Fashion, & Modernity is on display at the Art Institute of Chicago until September 29. Make a night of it at one of the remaining “Dress to the Nines” events.